There are countless weight loss apps out there that claim to give you the tools and guidance you need to improve your physical health. From calorie counting and food tracking apps, to running and fitness program apps, the number of choices you have can certainly be overwhelming. Only the best weight loss apps can help to maximize your results, which is why we've pulled together the following list. Whatever your health goals might be, these are the apps that you can rely on to help you achieve them. Calculates calorie targets based on personal stats and goals (age, weight, gender, etc.). Extensive built-in library of foods and exercise activities. Limited goal tracking with free version. No future date food or exercise planning with free version. Lose It! is the ultimate calorie counting app. The app will ask you a few basic questions about yourself and then give you a daily calorie target based on how much weight you want to lose. You get both a visual graph and log of your calorie breakdown based on the foods and exercises you log into the app. Price: Free with premium upgrade for $39.99 per year. Over 11 million foods included in its built-in food library. Recipe importer to easily move nutritional information from recipes to the app. Over 350 exercises to log plus over 50 apps and devices that can be integrated with it. No nutrient dashboard, food analysis or other features with free version. MyFitnessPal has the largest food library of all the food tracking and weight loss apps out there—even those from popular brands and restaurants. For recipes you find on the web, the app can walk you through the process of adding all the ingredients so the serving sizes and nutritional information is imported into your log. And of course, like Lose It!, you can use MyFitnessPal to track hundreds of exercises from within the app, from your fitness device or from a manual exercise entry. Price: Free with premium upgrade for $9.99 per month or $49.99 per year. Over 600,000 nutritious recipes built into the app for healthier meal planning. Short demos for cardio and strength exercises to help you use the right form. Free tips and advice from coaches. Lots of ads in the free version, particularly when trying to add foods. Not the most user-friendly interface with potential for errors or app crashes. SparkPeople is another very popular calorie counting app, complete with a massive nutrition database, fitness trackers, meal planner, exercise demos, barcode scanner, community and so much more. It's your all-in-one calorie counting app if you don't want to have a separate app for each individual weight loss goal. Price: Free with a premium upgrade for $4.99 per month. A clean and intuitive interface that displays all information in a visually pleasing way. Fast performance and easy to add foods/exercises. Image recognition for foods by photo-taking with your device's camera. Some minor limitations with the food database and exercise logging. If you don't want to pay to get the full features of a calorie counting app like Lose It! or aren't a fan of an app interface like SparkPeople, you'll want to check out Fat Secret. It's totally free (no ads!) and include everything from a food diary and health recipes, to a weight chart/journal and a whole community of people looking to offer support. If you want advanced meal planning and more, you can upgrade to premium. Price: Free with premium upgrades at $6.99 per month, $19.99 per quarter or $38.99 per year. Track all-day activity just by carrying your phone with you or use your phone's GPS to track the distance you run or walk. Track food intake using the app's built-in library of over 350,000 foods. Set and track sleep goals in addition to activity and food. Higher chance or error or inaccuracy when used without an activity tracking device. You don't need one of those snazzy Fitbit bracelets or clip-on devices to use this app. Besides being compatible to over 200 leading activity tracking devices, you can also use this app alone—either by logging your activity manually or carrying your phone with you and having the app sense your daily movement. Ability to set multiple run goals, including a weight loss goal. Get motivational audio updates during your run. Optionally get a personalized running plan to help you reach your goals. No progress insights with the free version. Runkeeper is a top app choice if you plan on sticking to a running routine to help you lose weight. All you need is your phone while you run (although it can be integrated with some activity tracking devices and heart rate monitors). Set your pace, following a training schedule and join challenges to help yourself reach your running and weight loss goals. Price: Free with premium upgrade for $9.99 per month, $19.99 per quarter or $39.99 per year. Personalized nutrition grades (A, B, C or D) makes it easier to select healthier foods. Built in barcode scanner that identifies hidden ingredients like added sugar, MSG, etc. Access to free health and diet tips from professionals. Although it has a large food database, many users still experience trouble finding certain foods. No macronutrient breakdown in the free version. Ads appear in the free version. Fooducate is an app that helps educate you as much as possible about what you're eating. Create a personalized nutrition plan based on your stats, goals and eating plan (keto, low carb, etc.) so you can get healthy recommendations based on the foods you enter into the app. In addition to food, you can also track your sleep, mood and hunger levels. The opportunity to earn cash for losing weight. Support from a group who participate in the same game. Individual referees verify participant weigh-ins. Games are only measured by weight loss, not other factors like inches lost or fat percentage. Points earned in your account will expire if you go inactive for a certain amount of time. DietBet is the ultimate motivational weight loss app, using cash rewards for working together as a group to lose weight. The more weight you lose as a group, the more you'll earn at the end of the game. Games are either one month long (Kickstarter) with a goal of losing 4 percent of your weight or six months long (Transformer) with a goal of losing 10 percent of your weight. Price: Free, but you must offer funds to participate in each individual game. Very visual interface with minimal clutter makes the app enjoyable to use. Focuses on foods and recipes that aren't just low-calorie, but also rich in nutrients. Recipes are given a score out of 10 according to nutrition density. Very limited tracking features with the free version. Rather than spending time scouring the web for the healthiest recipes, Wholesome does the job for you while also offering personalized recommendations based on your profile and tracking. The app tracks 90 nutrients in foods, going above and beyond the nutrient tracking that many of the other apps on this list offer. Price: Free with a premium upgrade for a one-time payment of $3.99. Real-time coaching from top coaches and athletes with no robotic voices. Personalized and adaptable workouts based on biofeedback. Video instruction to support proper performance. You have to pay to keep using it after the 14-day free trial is up. Lots of reports of bugs and crashes from users. PEAR claims to be the only app out there that delivers real-time, dynamic and interactive workouts from world-class coaches. The app takes your personal information and uses it to personalize your workouts with HIIT, running, spinning, strength training, yoga and more exercise types. As you work out, the app gets smarter and adapts your workouts to your performance. Price: 14-day free trial with in-app purchases ranging from $1.39 to $54.99. A food diary for people who don't want to count calories or macronutrients. Highly visual, clean and simple to use interface. No optional choices to manually incorporate calories if desired. YouAte takes the calorie counting out of losing weight by encouraging you to track your food, activities and feelings in a more mindful manner. It's a simple food journal that helps you capture your meals visually (by taking photos) and connecting it to why you ate it. The app will then give you more meaningful insights into your habits rather than calorie deficits or surpluses. Price: Free with premium upgrades at $5.99 per month, $14.99 per quarter or $36.99 per year. Focuses more on your relationship with foods rather than numbers. Incorporates psychological techniques to adopt healthier lifestyle habits. The app can only be used for free during the 14-day trial period. Food logging experience isn't as good as other popular calorie counting apps. Noom pulls together the expertise of personal trainers, nutritionists, doctors and psychologists to deliver a weight loss course that goes beyond number crunching. The app claims to help you change your unhealthy habits into healthier ones by "tricking" your brain with psychological techniques. Highly effective workouts that incorporate yoga poses body weight movements. Personalization according to desired goals and time for workouts. Limited use with a free plan (one workout that's only about 5 minutes). Not the greatest user interface. Geared toward women who love yoga but want more of a workout from it, Asana Rebel delivers traditional strength, cardio and even meditation practices with a yoga-inspired flare. It includes personalized training programs for whatever your goals might be, whether you only have five minutes to workout or a whole hour. Price: Free with in-app purchases ranging from $9.99 to $58.99. Ability to use preexisting timer templates. Bright, large and clear timer layout to see clearly during your workout. Ability to train with voice cues and music. The timer might reset itself if you close the screen or go to another app. Lots of reports of bugs. Seconds is not your average workout timer app. In fact, it allows you to use timer templates so you can create timers for your high-intensity, Tabata and circuit workouts. It has voice-guided cues so you know exactly what to do during your workout and even coordinates music to match the intensity. Price: Free with a premium upgrade for $4.99. Virtual trainers that offer motivation. GPS tracking, voice commands and in-app music. It might not show accurate distance recordings. Couch to 5K is a running program for beginners who are looking to start a running habit and track their progress. 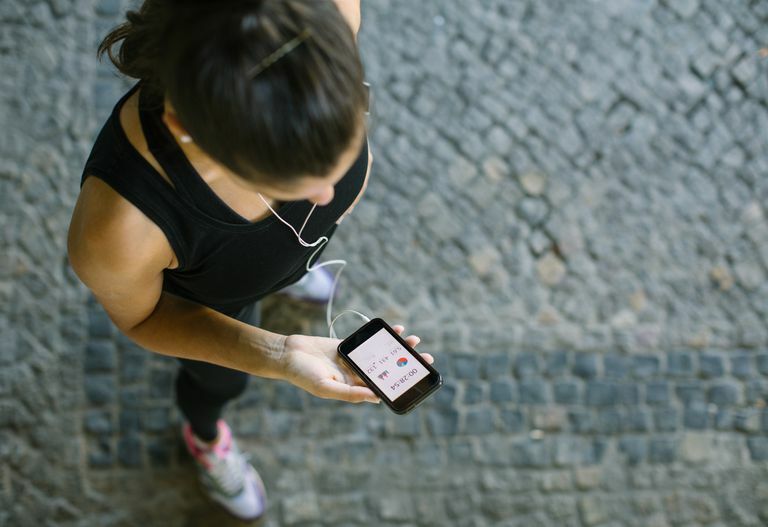 The app claims to help transform sedentary users into runners just by encouraging them to stick to a running habit three times a week for 20 to 30 minutes over a nine-week period.